Writer by day, ninja by night. So, yeah. I like JRPGs. But never played Final Fantasy IX until a month ago. I’m a bad person, I know. Finally, with the help of the Playstation Network, I was able to get my hands on a virtual copy of this game, and see what all the fuss was about. Whenever I say that I don’t care for modern Final Fantasy games, I am asked whether I played IX. Until now, the answer was no. But now, I can say I have. If you don’t know, Final Fantasy IX tells the story of Zidane, a young thief who bites off more than he can chew when the band of thieves he is a part of kidnaps the lovely Princess Garnet. Garnet surprises them all by wanting to be kidnapped, in order to escape from her mother and have a grand adventure. Zidane, a lady’s man if there ever was one, vows to protect Garnet, and even develops sincere feelings for her as the story goes on. Together, he and the princess get thrown into a world-ending plot, meet a cast of wacky characters, and learn something about themselves along the way. Like every other JRPG ever. However, that is not a bad thing. Final Fantasy IX was meant to get back to the roots of the Final Fantasy series. The previous Final Fantasies on the Playstation 1 were full of dark, brooding heroes and serious, angst-filled stories. That couldn’t be farther from the case here. Final Fantasy IX’s story may have moments of darkness, and there is death and destruction, but everything overall is far more upbeat and pleasant. The characters actually have moments of genuine humor (not that awkward stuff from Final Fantasy X and X-2) and a clear focus has been placed on having them develop naturally. Zidane is a good and likable protagonist, who is just trying to do the right thing. He pokes fun at others, is a bit too flirty with women (and has some heavy-handed dialogue as a result) but he’s enjoyable to be around and doesn’t mope about. Garnet proves to be a fun character as well, choosing to rename herself to Dagger early on to hide her heritage. Her story of finding herself is very well done. Other characters such as Freya, Eiko, and Amarant are also well-done, though they don’t get as much attention as Zidane or Garnet. Who really steals the show though is Vivi the black mage. With an awkward gait and somehow sad eyes, Vivi is a character the just grabs your heart and won’t let go. More than once I wanted nothing more than to give the little guy a hug—he looks like he needed it. And his story too, one of wondering who he is and coming to terms with death is one we can all relate to. Vivi is my favorite Final Fantasy character, Balthier included. Period. The back to the roots approach extends to gameplay as well. Unlike other Final Fantasies where you can customize your characters to fit any role, here every character’s role is hard defined and built into their character. Zidane is a thief. Garnet is a summoner. Eiko is a white mage. Vivi is the black mage. And so on. These roles are actually built into their characters, extending their personality into the battles. You learn the characters’ strengths and weaknesses through the story as much through battle, and it goes a long way to making the story and battles feel connected. Graphically, the game looks dated (as all PS1 games tend to do) but that does not mean it looks bad. Much of the backgrounds were done in high quality 2D artwork, and that stuff holds up well. The character models are low-polygon, but very well-animated (Vivi’s dance in battle is adorable). When the camera zooms in during battle, you can actually see more detail on the character models. The FMVs hold up pretty well too. However, not everything about the game is perfect. A product of being on the PS1, battles take forever to load. Every random battle (which is not a high rate, fortunately) takes close to ten seconds to load, and that really adds up. That, and battles can feel a bit sluggish as well, even with the speed turned all the way up. The game uses the ATB system, but turning up the speed only increasing the rate in which those bars will fill. It’s not uncommon to have all four characters in battle get their turn while one monster animation plays out. None of the animations are too long (and summon spells actually shorten after you see them once) but battles do tend to drag. That, and the game is not very difficult. I may have been spoiled by such recent games as Shin Megami Tensei IV, but most battles can be won by just mashing the attack button. Some planning goes into how characters learn skills (since you learn skills based on your equipment) but for the most part, just attacking will get you through most any encounter. There’s also some annoying side-quests that I didn’t bother with. Chocobo Hot and Cold is basically a “Find the hidden thing” mini-game, and apparently required if you want all of the rare items. The game lets you poke around a small screen with a chocobo, pecking at the ground and looking for loot. More often than not, you’ll find one or two potions and have to play again. Supposedly, you get better stuff the more you play, but I can’t see myself spending hours doing this game just for better loot. Loot that isn’t really needed, since the game isn’t hard. Fortunately, the music is great! Nobuo Uematsu did a wonderful job with the score, especially that battle theme. The battle theme starts playing while the battles load, and does a great job of getting you pumped up. Even now, a month or so later, I find myself humming some tunes from the game. Excellent. Overall, Final Fantasy IX is a great Final Fantasy game, one that harkens back to the days when the series knew what it was doing. Some parts feel dated, but the core of the game holds up great. 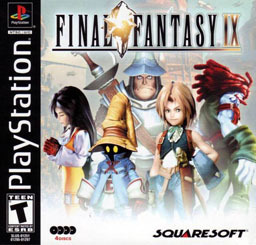 Square Enix should really look back to this game for inspiration moving forward with the series. It would make for a better game than any of the Final Fantasy XIIIs.